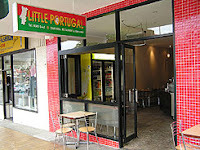 Went to Little Portugal along Marrickville Road for dinner to celebrate my sister's birthday this week. We got there 5 minutes into extra time of the Australia-Japan match in the Asian Cup 2007. The actual game played out yesterday night in Hanoi, but since I haven't read the news, it's still an exciting game to watch. After 30 minutes of extra-time play, the score is still tied at 1-1. Japan could've closed off the match with some promising attempts, but Mark Schwarzer managed to block the balls. The game went into penalty shootout. Japanese goalkeeper Yoshikatsu Kawaguchi turned out to be the better man, denying Harry Kewell's and Lucas Neill's penalty kicks. Despite Schwarzer's valiant attempts, Japan won the game on penalties 4-3 to move on to the semi-finals. Such a sorry ending, but the food was great though. From the street, Little Portugal looks like a take-away shop. Don't mind that, just walk straight in and you'll find the (small) dining area. We ordered a whole Portuguese chicken and large chips, which were served almost immediately (after the complimentary bread and butter). My first time to try Portuguese chicken - quite a distinctive taste. And the chips is at par with McDonald's. (That's a compliment.) 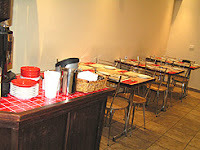 Our other dishes took a while to come out, so they must be freshly prepared. We had diced pork with potato chunks and pipis and another dish called Bifina (beef steak, bacon and egg, served with wafer thin potato chips, pickles and rice). The servings were so generous we didn't get to finish everything. So no dessert or coffee for us.